BridgeWorks is a group of photographs created by Cherry Street Pier artist-in-residence James B. Abbott, which includes the rarely-seen superstructure and architectural interiors of Philadelphia’s iconic Benjamin Franklin Bridge. Abbott has been photographing the ever changing landscape of Philadelphia’s waterfront since the early 80s. 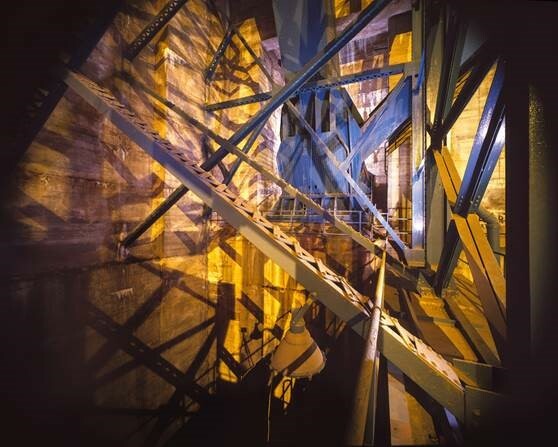 The images in BridgeWorks were taken between 1981 and 2000. The exhibition will run from December 6th, 2018 to 22nd, 2018. There will be an artist reception on Saturday December 15th from 2:00-5:00pm. James B. Abbott (American, b. 1954) has lived in the Philadelphia area since 1980. His photographic subjects ranged from Venice to the Ben Franklin Bridge, from urban cityscapes to the solitude and rich natural beauty of Cape Cod. Abbott received a BFA from the Cranbrook Academy of Art, Bloomfield Hills, MI. Many important public and private collections hold Abbott’s work, including the Allentown Museum of Art, Cranbrook Museum of Art and Philadelphia Museum of Art. The Print Center, a nonprofit gallery located in Philadelphia’s historic Rittenhouse Square neighborhood, encourages the growth and understanding of photography and printmaking as vital contemporary arts through exhibitions, publications and educational programs. The Print Center is an international voice in print; our global outlook coincides with a strong sense of local purpose. Recognized as a locally significant and internationally respected gallery, an art education provider and an artists’ advocate, The Print Center is known for supporting emerging and established artists; developing unusual and intriguing programs that attract a diverse audience; and making art accessible to all members of the community. Founded in 1915 as The Print Club, one of the first venues in this country dedicated to the appreciation of prints, the organization supported the "dissemination, study, production, and collection of works by printmakers, American and foreign." In 1942, The Print Center donated its collection of prints to the Philadelphia Museum of Art forming the core of their fledgling print department. Today The Print Center programs include solo and group exhibitions; the ANNUAL International Competition, one of the most prestigious and oldest juried exhibitions in the US; The Print Center Series, compelling programs surrounding the printed image in contemporary art; the Artists-in-Schools Program, a nationally recognized program bringing art education and awareness to underserved youth in Philadelphia public high schools since 2002; The Print Center publications; and the Gallery Store, offering the largest selection of contemporary prints and photographs available for sale in Philadelphia.